You can download the visitor's guide here. For lodging ideas, please take a look at our accommodations page. Homewood Mountain Resort is located on the West Shore of Lake Tahoe in California. It is located 56 miles and approximately 1 hour 15 minutes from the Reno/Tahoe International Airport. The North Lake Tahoe Express provides shuttle service to and from the airport. 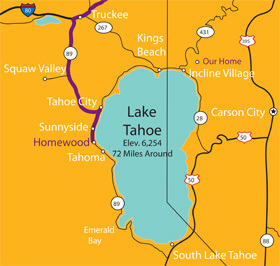 Check out Lake Tahoe Traveler or the North Lake Tahoe website for information on Lake Tahoe.